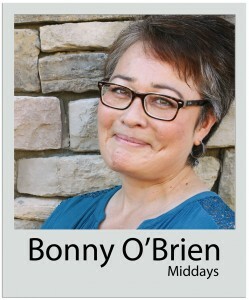 Bonny O’Brien, hosts the Mix 96.9 Midday Show from 10am until 3pm. Bonny is an “Army brat” having grown up in a military family. She has lived in Italy and Germany, and traveled to Spain, Switzerland, Austria and France. Bonny graduated from Butler High School and has both an associate and a bachelor’s degree. In 2013, Bonny was diagnosed with mucinous carcinoma breast cancer. Throughout her journey she kept, and continues to keep her listeners “in the know” through her Facebook page with encouraging words and funny anecdotes. Bonny has an 11 year old daughter, Dana, who attends school at Mountain Gap. Bonny’s radio career spans over 30 years, and she is well-known in the Huntsville market. She was nominated by Billboard Magazine as Personality of the Year, and Small Market Personality of the Year from Gavin Magazine.